One day I was looking for a new chicken recipe and found this one during a google search. I had all the ingredients needed (as I’m sure most people do) and decided to give it a shot! I knew it was something everyone would like in my house and it sounded really good! It was delicious!!! The chicken had the perfect combo of crunch on the outside and tenderness on the inside and it was very flavorful and easy to make! 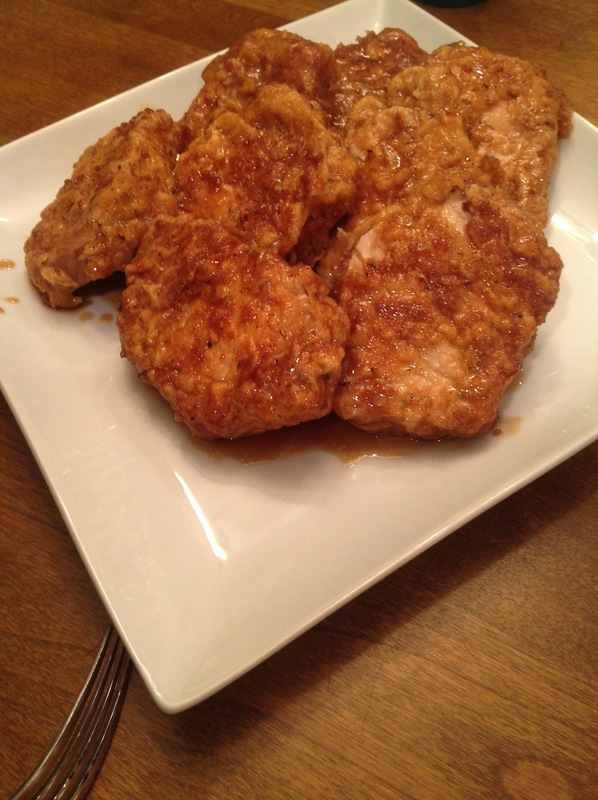 It was so good I even made it once using boneless pork chops! I liked the chicken better for the tenderness of the meat, but the pork was good too! Slice the breasts by placing them flat on a cutting board and using a very sharp knife to slice them into halves horizontally. Sift together the flour, salt, black pepper, ground ginger, nutmeg, thyme, sage paprika and cayenne pepper. Whisk together the eggs and water in a separate bowl. Season the chicken breasts with salt and pepper, then dip in the flour and spice mixture. Then dip into the egg mixture and then a final time into the flour and spice mix, pressing the mix into the meat to get good contact. Heat a skillet on the stove with about a half inch of canola oil covering the bottom. NOTE FROM ORIGINAL RECIPE: You will want to carefully regulate the temperature here so that the chicken does not brown too quickly. The thinness of the breast meat practically guarantees that it will be fully cooked by the time the outside is browned. I find just below medium heat works well. I use a burner setting of about 4 1/2 out of 10 on the dial and fry them gently for about 4 or 5 minutes per side until golden brown and crispy. Drain chicken on wire rack for a few minutes and then dip chicken into the Honey Garlic Sauce. In a medium saucepan add olive oil and minced garlic. Cook over medium heat to soften the garlic but do not let it brown. Add the honey, soy sauce and black pepper. Simmer together for 5-10 minutes, remove from heat and allow to cool for a few minutes. Watch this carefully as it simmers because it can foam up over the pot very easily.